GyPSy Guide GPS driving tour of Arches is an excellent way to enjoy a sightseeing trip to explore the national park. There are 70+ audio points that play automatically, featuring what to see, stories, tips and advice. All the benefits of a guided tour, the freedom to drive yourself. 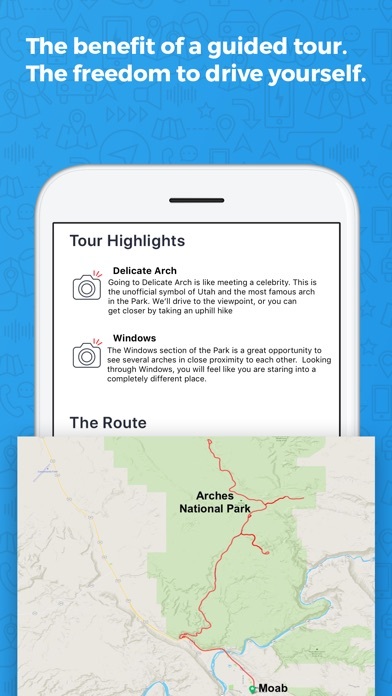 TOUR GUIDE AS YOU DRIVE AROUND ARCHES If you like driving yourself when you go sightseeing, GyPSy Guide™ tour apps allow you to enjoy a guided tour experience while remaining totally independent. By driving yourself, you'll be able to get from place to place faster, see more things and not be tied to anyone else's schedule. DON'T MISS OUT ON THE BEST SIGHTS AND STORIES The tour apps use your device’s location abilities to play the commentary AUTOMATICALLY. All you have to do is drive, listen and decide which places you want to stop at. Our tour guides have created an insightful and entertaining tour of Arches National Park. We’ll recommend the best places to experience and some great locations that most visitors will drive by. PLAYS AUTOMATICALLY GyPSy Guide knows where you are and which direction you are heading, and plays commentary automatically about the things you are seeing, plus stories and tips and advice. EXPLORE LIKE A LOCAL It’s just like having a local friend to show you around. And that friend just happens to be a professional tour guide. GREAT VALUE The same information you would get on a bus tour or from a guide book, for just a fraction of the price. And you control the itinerary and schedule. WORKS OFFLINE No data, cellular or even wireless network connection needed while touring. Anyone can use them with no need for roaming data – even visiting from another country. DRIVING TOUR ROUTE The tour includes the most popular sightseeing stops and many more: 1) Park Avenue 2) Balanced Rock 3) Windows 4) Delicate Arch 5) Skyline Arch 6) Devils Garden 7) Landscape Arch You can join the tour from Moab or anywhere along the route from campgrounds and RV parks. Since you drive in and out of the Park on the same road, there is different commentary on the way out. NOTES Because the app is filled with audio commentary and maps, its larger than "normal" apps. If you have a limited data plan, its recommended to download over a WiFi network. ++ Continued use of GPS running in the background increases battery usage - we strongly recommend taking a cigarette style (DC outlet) car charger. This is much better than simply plugging into the USB port in a vehicle. ** iPad users - please note that WiFi-only iPads will not activate the commentary automatically. Any iPhone or network-capable iPad (WiFi + Cellular - whether you have a network connection or not) will work just fine. ABOUT US GyPSy Guide™ produce award winning audio tours along scenic drives around the world. Enjoyed by travelers who prefer to set their own pace and itinerary on vacation, but enjoy a fun, informative and educational guided experience. Our goal is to provide a great introduction to the region and perhaps inspire you to learn more and return. None of our apps include paid advertising or placements for benefit. 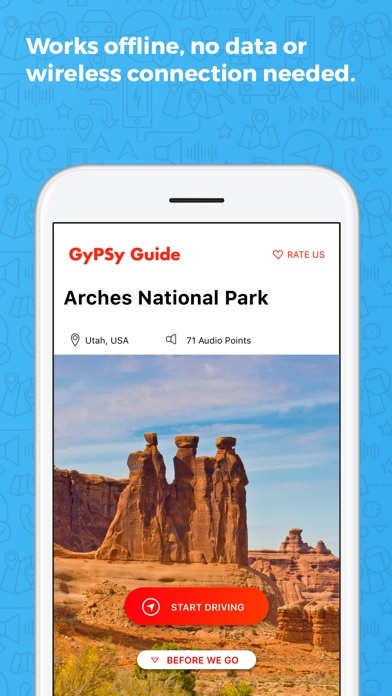 After using the Gypsy app in Yellowstone, we were so impressed, we purchased the app for Arches National Park as it would be our next stop. When in Yellowstone, the app works from whatever direction you enter the park and whichever direction you’re driving. We assumed that the Arches app would work the same so we decided to beat the crowds and start at the back or the park, working our way toward the front. Unfortunately, it wouldn’t work in this reverse fashion and we missed out on most of the information. Used this in Arches, read reviews that it works even with no cell phone service. I thoroughly enjoyed the tour and commentary. The right mix of geology, history, anthropology, and sites to see and why. We would have had no idea what we were looking at without this tour. 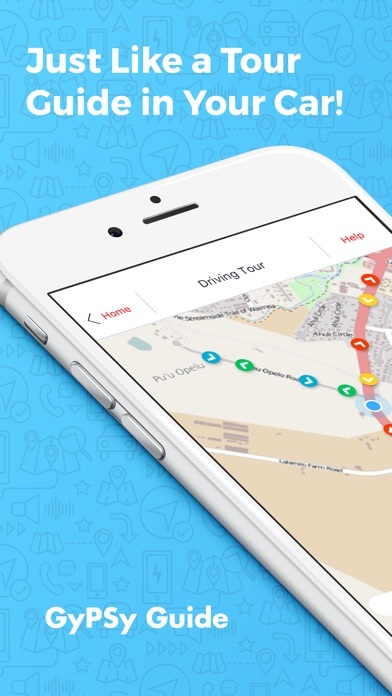 The app worked flawlessly, and was really like having a personal guide in the car with us. Worth every penny! Guide was great and very informative. The sound would not work over the speakers in my car (not a rental). My battery was about dead so I was trying to charge it with a USB cord. But we couldn’t do both at the same time. I am hard of hearing so it was difficult to understand what he was saying over the road noise. We could not run the AC at the same time and hear what he was saying. Not everyone in the van could hear him, only the front row and the middle row could if they leaned up front by us. Back row was out of the question. Not worth the money if not everyone can hear the tour.... I did really like what I could hear. They guy had good stories and was fun to listen too. This app is totally worth the money if u r visiting Arches National Park. It made the journey much more interesting with fun facts along the way. Make sure u download the app before starting ur trip. The cell phone access is very bad in there park but if u download the app first u it uses satellite gps and not cell phone so it knows where I are and starts playing cool facts about where u are in the trip. Must have app to visit the park u will get so much more out of the park with this app. Enjoy I know we did!!! Having this app made our visit to Arches so much more enjoyable. We learned so much. I'd recommend this to everyone who visits. I have worked in I.T. over 50 years and this is one of the worst apps I have ever used. It definitely does not work as advertised. Commentary usually never works. It is never automatic. Have tried it on my iPhone & my wife's Android Samsung and it did not work on either phone. I definitely do not recommend anyone purchasing this app. It is a waste of money! I expect a refund for this app. It was a very disappointing experience! Awesome - both the Park and the app. 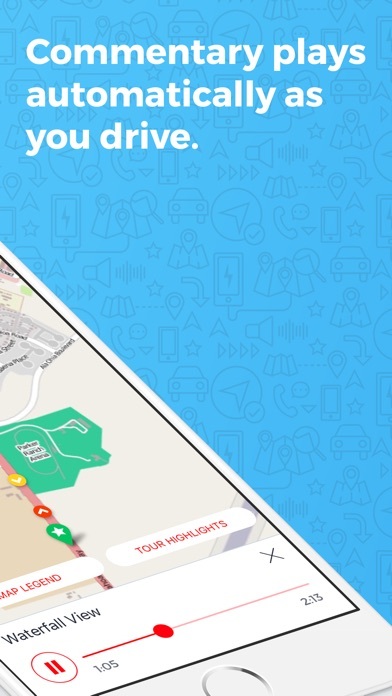 It was our first visit to the park and the app lets you know where to pull over and what to look for. It also provides background on the park; how it was formed and important people in its history. 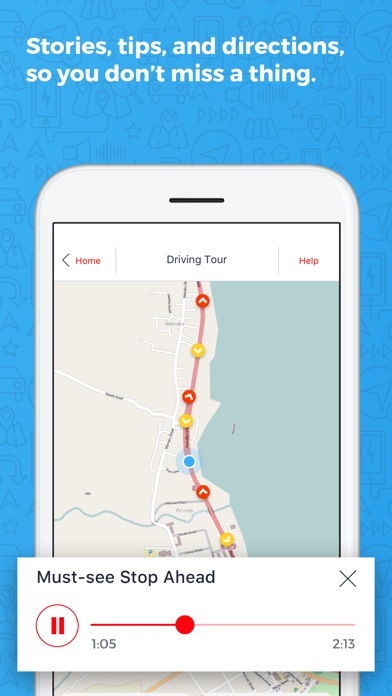 Just drive along and the app tells you where to look, where to drive, and what you are seeing. All without you doing the prompts. Excellent! Excellent program. Got way more out of the park than we would have without. Than you.